The smooth slippery, pressure bearing tissue carpeting, the surfaces of the bones varies in thickness across different articular areas. It is essentially a bed of tough collagen fibres bound by special glycoproteins. On the condyle, the tissue is thickest in anteroposterior direction and thickness is greater medially (average measurements 0.37 mm laterally and 0.48 mm medially). On temporal component, it is thickest along articular eminence and preglenoid plane. The thickness is less medially (0.49 mm and 0.36 mm for eminence and plane respectively laterally and 0.45 mm and 0.34 mm medially). In the depth of the mandibular fossa the thickness of periosteum is merely 0.07 mm. Histologically, the articular tissue is arranged in successive layers. The surface layer is composed of thick, strong, tightly packed collagen fibres running parallel to surface forming an interlaced firm fabric which resists destructive torsion under heavy loading. A narrow transitional layer of less compactly packed fibres slanting obliquely lies underneath. Below this oblique layer a zone of strong vertical fibres is found which contains scattered cartilage cells in between fibres. Deepest layer is calcified cartilage lying on subjacent cortical bone. All these tissues including articular disc are saturated with water containing aggregates of protoglycans which makes for a tough, resilient and flexible construct that can sustain considerable loading forces. It is a thin sleeve of tissue investing the joint completely. 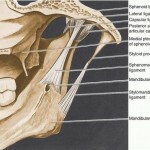 It extends from the circumference of the cranial articular surface to neck of the mandible. Outline of capsular attachment on cranial base can be followed from anterolaterally to articular tubercle, laterally to lateral rim of mandibular fossa, posterolaterally to postglenoid process, posteriorly posterior articular ridge, medially medial margin of temporal bone at its suture with greater wing of sphenoid and anteriorly it is attached anterior to preglenoid plane so as to enclose the same within the joint cavity. It is to be noted that posteriorly it is not merely inserted to crest of post glenoid process and ridge but also to their entire anterior surface so there can be no contact between this bony rim and condyle because both capsule and retrodiscal pad of soft tissue intervene. The outline of attachment on the mandibular neck lies a short distance below the edge of articular surface in front and a considerable distance below the articular margin behind. Laterally it is attached to lateral condylar pole but medially it dips below the medial pole (Dubrul, 1996). Anteriorly in the region of anterior extension of the articular disc, it is deficient, where it is pierced by anterior extension to give attachment to the lateral pterygoid muscle and that is the weak point in it. The capsule is loose above the attachment of articular disc and tight below it (Kreutziger and Mahan, 1975). Since the articular disc is attached to inner surface of the capsule, dividing the joint cavity into two compartments, Fennol et al (1992) considered the capsule in two parts i.e. the fibres extending from condyle to disc and from disc to temporal bone thus forming two joint capsules. 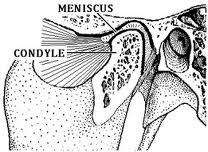 The longer bands extending from condyle to the temporal bone are regarded as reinforcing fibres by them. 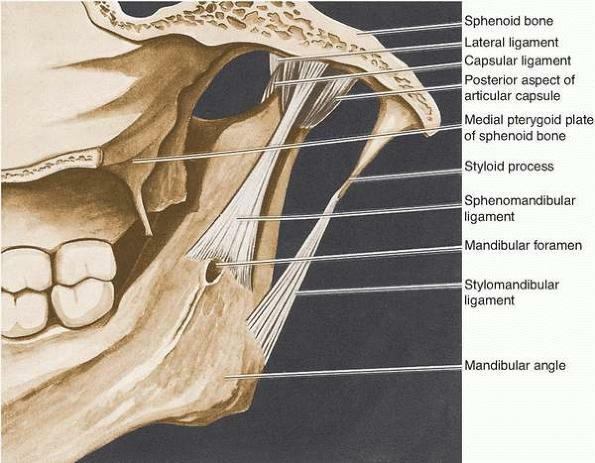 According to Schmolke (1994), true capsular fibres passing between mandibular condyle and temporal bone are present only on the lateral side of the joint while on the other three sides i.e. posteriorly, medially and anteriorly, the upper and lower laminae of articular disc are attached separately either to temporal bone or mandibular condyle. The synovial membrane lining the capsule covers all the intra articular surfaces except the pressure bearing fibrocartilage. Thus it covers the upper and lower suface of soft retrodiscal pad. In lower compartment the lining continues on the inner surface of the capsule and then reflected on the condylar neck to a short distance to articular margin on the anterior aspect of the neck and upto articular margin on its posterior aspect. 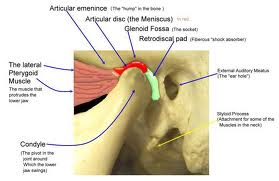 This forms fluid filled folds (sulci) in marginal gutters of joint cavity. Similarly in upper compartment the membrane lines the innersurface of the capsule only and not the articular surface of temporal bone or superior surface of disc (excepting both surfaces of bilaminar region) (Dubrul, 1996). In this way, situated at the posterior and anterior ends of upper and lower compartments are four capsular or synovial sulci. These are upper anterior et posterior and lower anterior et posterior synovial sulci. These change shape during translatory movements which requires that the synovial membrane should be flexible (Toller, 1974). Articular disc is a roughly oval, firm, fibrous plate with its long axis directed transversely. It is shaped like a peaked cap which divides the joint in a larger upper compartment and a smaller lower compartment (Williams et al, 1999). Most of the authorities consider that rotatory movements take place in lower compartment and translatory movements in the upper, however Hilloowala, (1975) suggests that rotational movement involves both compartments and the joint should be termed diginglymous rather than gingylimo arthrodial. Superior surface of the disc is said to be saddle shape to fit into cranial contour while inferior surface is concave to fit against mandibular condyle. The question of whether the shape of disc is genetically determined, produced mainly by biomechanical constraints or both is still being discussed (Williams et al, 1999). This entry was posted in Oral medicine, Oral medicine and pathology and tagged anatomy of temporormandibular joint, articular disc, articular eminence, condyle, fibrocartilage, glycoprotein, greater wing of sphenoid, mandibular fossa, preglenoid plane, temporal bone on March 10, 2012 by chzechze.